This happens all the time, also with other player wonders like Computer Core and Central Bank. So far I was unable to determine a pattern, but it could possibly have to do with loading a savegame. If would be fine if it only happened after conquering a planet that has such improvements (when you destroy those and then rebuild them somewhere else). But it definitely also happens without getting them first from another civ or minor race. Hmm.... I did try a save game to see if that was were it was breaking and I wasn't able to repro. There may be something with losing a planet? I'll check the code, but I'm not seeing anything yet. Lose the planet the player wonder is on (this allows you to build it again). Build another copy of the player wonder. Retake the planet with the original wonder on it. You are right about building more than one wonder after loosing the first one. See this post for some details. However, it is possible to build more that one Import Export Center without this happening. I think it has something to do with other races loosing it. I'm not sure if it applies to the other wonders. I submitted some information on Discord on April 18 that seems to have been missed. I included a zip file with a save and detailed information about what I saw and what I did. What I did was not part of a normal game, but I think it may show where the problem is. You can get the file here. Not for me, no. I didn't lose any planets yet, I could build the second Import Export Center right after building the first one only a couple of turns into the game. In the meantime I can build a third Import Export center. I don't know when exactly that showed up but I assume it had something to do with conquering the homeworld of another civ (on which the building didn't exist), the only planet I conquered so far in my current game. Would a save of my current game help? Edit: I lost a planet by cultural influence to the Snathi, but that was much later than the point where I was able to build the second Import Export Center. I play with a bunch of Steam Workshop races, don't know whether that has something to do with it. But would a savegame by playable for you if you don't have my races? I built the import/export wonder and Research Core on my homeworld and have never lost my homeworld nor been invaded, yet I have been able to build the import/export wonder two additional times on other planets and the computer core once more. I have not conquered another Major Civs' Homeworld, but I have taken a minor or two. Definitely not. I am 100% sure that I can sometimes build a second Import/Export Center before gaining or losing any planet from/to the AI. To reproduce and debug this, I assume you guys need a savegame where an additional player wonder suddenly becomes buildable after hitting end turn. I will check my saves and keep an eye out for that in the future. I've been able to build two or three import/export centers. I usually notice this after i capture a planet that already has one, usually a civ capital. This is not the case with just Import/Export Centers. In my experience, if you capture any colony with a pre-existing player unique improvement that you can also build, you can actually destroy it (if it is destructible), and it will appear in the action list for all colonies as if you have never built one yourself. But that's not the only way how you become able to build player-unique buildings more than once. As I said in my game I conquered only one planet, and although it was the capital of another race it had no Import Export Center on it, and I was able to build two even before I conquered that world. Presumably after conquering it I could in fact build three. Biggest issue with game, at least in my opinion, is still in place. Hard lock on map sizes. Game still sitting on shelf. I once had 3 Central Banks by turn 20 or so. Ended up placing my econ capital adjacent to all of them. I suspect it has something to do with an AI building and canceling, or destroying, said wonder. 1/Civ, if 1 civ fumbles it is up for grabs? edit: for further clarification on this issue, I have gone through games where I'll take over several Minor Civs all at once. Sometimes I'll have 4 extra Computer Cores within a couple turns. If I destroy one, I can rebuild it (but only if I'm not currently queuing another one). If I destroy 2, I can only rebuild one - the limitation seems to apply to no more than one being built by a civ at a time, but once that one is rebuilt, I can destroy and rebuild another. Is the Extreme Colonization / Barren worlds issue fixed yet? In my last game I traded for Extreme Colonization, and was unable to colonize Barren, Frozen OR Aquatic worlds. perhaps the population should have a proportional amount of legion granted to make invasions harder and more realistic. 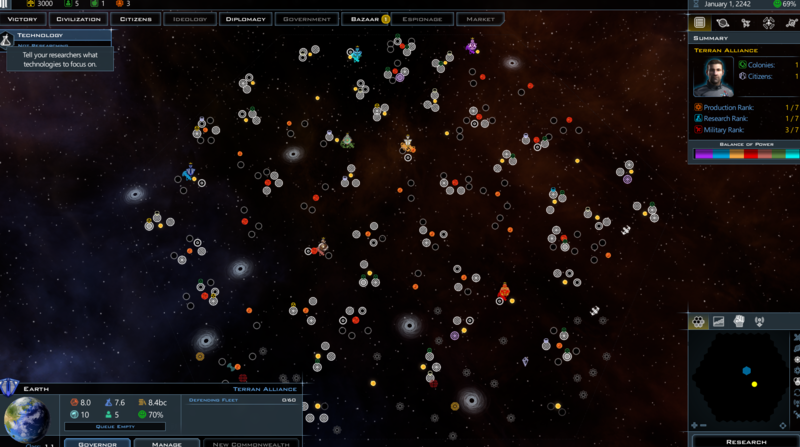 as it is many planets have absolutely no defense and the AI does not take adequate precautions on invasions. I find it difficult to defend as well since you have to have generals stationed to have legions that can not be spread around to several colonies as needed. this is why I choose the paranoid ability giving ships to all my colonies but the AI does not have this luxury unless I edit all the races or the few that have it , do have it. the promotion for scientists for unlimited turns on a tech is too powerful or at least the AI should use it against you, which I do not believe it does. It should be limited to a percentage of the research and not just hand you any tech regardless of cost I think. 1. Legions: This was stated as intentional, once you have destroyed the enemy's fleets, the war is, for all intents over, giving each planet a legion just prolongs the inevitable. 2. Promoting a worker: Did the improvement finish on the next turn? I've had that happen to me before, where the UI doesn't update, but the project still finishes on the next turn. 3. Promoting scientists: It IS powerful and I agree the AI should use it as well. 4. Getting N/A for research turns: I believe that the number is based on the research points you made last turn, but that number is apparently not saved with the rest of your game. I often get a different number then the correct one on smaller maps when I have picked up a large number of anomalies on the previous turn. 5. Promethion and Silicon life: Probably a balance issue when they only need one resource to grow. Maybe Derek has some official answers? thanks for all the great answers. always interested in improving my play and knowledge. Any advanced tips are welcome. Does the computer AI ever build carriers ?? I have never seen one yet. Perhaps I should consider not building them as they seem OP. Especially with healing ships. I also noticed on Iconia the YOR built farms. is this an oversite? *** What is most powerful opponent you can make (abilities) or play against ? Some simply are weak like the Torians. I have GRM mod so I can use those races too. I am just not certain as to the best possible opponent. Also the races sometimes build huge missile defense ignoring the fact most of their enemies use Mass Drivers. Playing the 3.03 opt-in as the Terran Resistance I can build the Import Export Center twice. With other civs that happens with other player unique buildings also. I'm unable to reproduce this, is anyone else seeing this? I have a save with the option to build more than one Import/Export center, but am not sure how to send it to you.